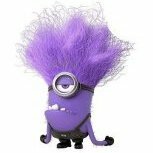 I am using binhex-plexpass docker. I have a E3-1275v6 CPU. In plex server settings I have Use hardware acceleration when available turned on. Is there anything else I need to do with unRAID or plex to get it working? I am not seeing the hw tag in the info when looking at server transcode info. what are these parameters for? " --device /dev/dri:/dev/dri" . Where do you put them? Thanks for info! I will try it out after my parity drives rebuild. Had to replace one. Also, please note that on the "--device /dev/dri:/dev/dri" line that goes in Extra Parameters, there are two dashes in front of the word "device" and not just one. It is easy to see that as just one dash and that will not work. So I did all this and rebooted. How can you tell if working correctly? Either stream a video that you know is not in a format your client supports natively, or, force a transcode by setting in a Plex client a video quality that is very different than the source. Check the status of the playback in the Plex Server status screen. You should see an (hw) next to something like MPEG2VIDEO transcoding to H264 (hw). when type that in at root@Milyard-Tower I don't get error. I get command line right back. That's good. That would indicate the i915 driver is loading. I am away from my server and won't have access for about 90 minutes. I'll have to get back to you when I am home and can do some tests. Gotta head to a meeting. That would be great if can help me fix this. Do you see this on your server? Do you have a /dev/dri folder with the contents as shown above? If you do not have the contents of the /dev/dri folder as shown above, do you have another graphics card in your server, either discrete or onboard (for example, a BMC for IPMI)? If so, is it set to the primary graphics adapter in the BIOS? I believe the iGPU needs to be primary in order for the drivers to load for hardware transcoding to work. If another graphics card is the primary the /dev/dri drivers are not loaded. Last login: Thu Mar 8 16:02:54 -0700 2018 on pts/0 from 10.0.1.17. 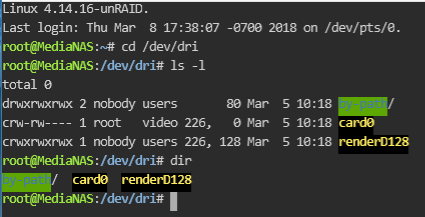 Well, you don't have renderD128 and that is the problem. That is the QSV driver needed for hardware transcoding in Plex. So, no other graphics card in your server and "onboard (or whatever your BIOS designates for iGPU)" is set to primary adapter in the BIOS? That was it! It was set to AUTO! Changed that and now working! Thank you so much! No problem. Glad it's working! So one more question about hardware transcoding. So would adding say a GTX 750 ti or something also work? Say more powerful? Can you use CPU and GPU? No, cannot yet be done. unRAID does not have NVIDIA drivers and there are limitations with GPU-based transcoding in Linux. Even if you had both a QSV capable CPU and an NVIDIA GPU installed, only one or the other could be used. Integrated GPU with QSV is the only currently-available option for Plex hardware transcoding. Your CPU (assuming it is the one in your signature) does not support Quick Sync Video. At least a Sandy Bridge CPU is required for H.264 encoding and even more modern CPUs are required for encoding of other formats such as HEVC. Your i3 530 is of the previous generation and supports Clear Video only and not QSV. Clear video has no hardware encoding support. Whoops, how do I edit my signature? Because I dont see it, I actually have an i7-7700 now, I think I got it working actually, see the (HW) when transcoding. It is an option on your Account Settings for the forum.